Our fireworks factory in Wallerawang, New South Wales, is a relatively new construction which follows strict safety guidelines. We have rebuilt the site according to SafeWork-recommended standards for industries dealing with significant stocks of explosive materials. For all NSW sites where fireworks are to be stored or manufactured, the construction (including mounding) of magazines and process buildings are built to minimise heat, sparks, friction, electrostatic discharge and impact damage. We adhere to strict firework classification guidelines, appropriately separating their storage and manufacture. All separation distances are respected. All buildings are protected by security equipment and staff and against lightning strikes. Within this safeguarded site, Howard & Sons chemists, pyrotechnicians and other employees follow a long list of on-premises and legislative safety guidelines. The Wallerawang manufacturing facility is the magic centre of Howard & Sons Pyrotechnics operations. It is here where we experiment, learn, design, test and finally produce our incredible range of Howard & Sons products. 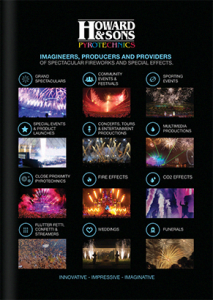 This hub of activity is dedicated to creating pyrotechnics products and firing solutions for every possible type of show, from huge multimedia events featuring complex choreography to beautiful wedding fireworks to end the perfect day. We store sufficient stocks of our fireworks and are able to present a show at a moment’s notice. We have the experience and contacts for all logistics solutions which will bring our team and every piece of equipment to anywhere on the globe. Please refer to AEC 3 for all technical details relating to EPGs and the requirements to be followed when transporting dangerous goods.